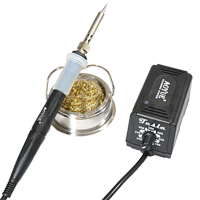 Soldering station Aoyue Tesla is a high performance soldering iron. It is equipped with a fast acting PTC ceramic heater suitable for advance soldering needs. The separate tip and heater design offers cost efficiency and easy replacement of tips. This uses that standard types of tip. The portable and lightweight design of the system save precious desktop space and allows easy packing for occasions when offsite soldering is required.